If you’re reading this article, you’re probably already aware of the Valve/HTC partnership where HTC will manufacture the Vive, a virtual reality head mounted display, powered by Valve’s SteamVR platform. As part of the reveal, one new piece of technology was introduced to the public: the Lighthouse. This is a brand-new-to-VR technology which will be used as part of a system to track the position and orientation of a user’s head mounted display and controllers throughout an entire room. With Lighthouse, instead of using VR in a chair or standing in place, its room-scale VR feature allows you to use the space of an entire room as a stage to physically walk around in a virtual environment. This article is based on publicly available information. Be aware that we are trying to explain a system that is unreleased, subject to change, and has very little publicly available information. Some elements of this article may prove inaccurate at a later date. With any complex system, there are many rules, details, and exceptions to explore. This first article is just going to cover the tech basics (but will still be plenty meaty for many). We’ll consider more detailed issues in later articles. The purpose of this first article is to clear up some of the common misconceptions concerning the Lighthouse technology. It will also serve as a starting place for additional articles on Lighthouse and on the various aspects of the HTC/Valve partnership. By understanding how this one component works, we can understand much more about what HTC and Vive are trying to deliver to consumers. They’re not just cranking out randomly incremental or independent technological solutions here; Valve is running a very deep and highly integrated game plan. What is the Value of Virtual Space? Many fans do not want to hear the critics of virtual reality; they don’t want anybody killing the dream. Putting our fingers in our ears and downvoting anyone who disagrees with us isn’t going to help move VR forward. We need to listen to the critics of VR to figure out what we’re doing wrong. We need to listen to the critics of VR to figure out what needs to be done better. In response to Today’s Glimpse into the Virtual Home, Redditor Rosc questioned the value of virtual spaces. Why would he or anyone else want to walk over to a virtual desk or walk through a virtual arcade, as opposed to directly accessing those items with a modern desktop? This blog is about going beyond the science fiction descriptions of the Metaverse and actually fleshing out some of the concepts, designs, and details that are useful in bringing it to life. The ideas described here are not to be interpreted as the exclusive way for the Metaverse to be designed. We’re here to put a stake in the ground. We hope to start the conversation (where it doesn’t already exist) and to move the conversation forward. How do you navigate between unrelated virtual worlds? Back in August 2013 when I first envisioned how I wanted a different model of the Metaverse to work, one of the fundamental questions I had was in how to glue everything together. Instead of building one large Metaverse and splitting it into pieces, as has been done before, I looked at a different solution. How do we start with a bunch of unrelated pieces of software and combine them together to form a larger Metaverse? How can we help the next attempt at the Metaverse to be more successful? 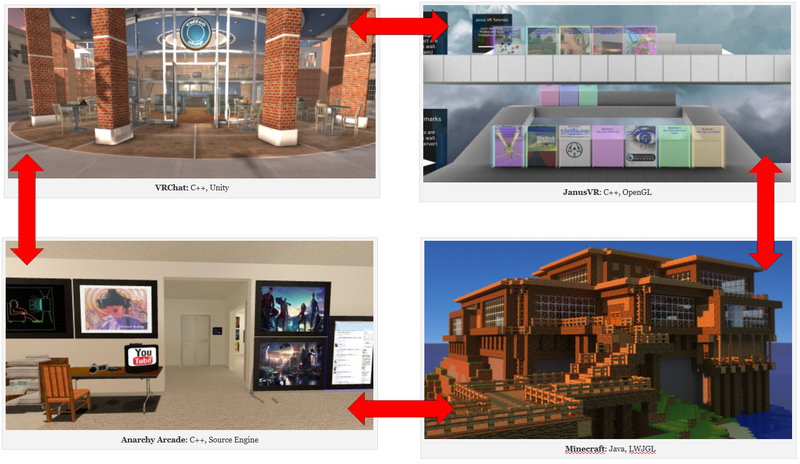 This article will present the idea that our attempts to directly build the large general-purpose virtual environments (“to build the Metaverse”) are, in itself, what have prevented a successful Metaverse from happening. The Andromeda Blog warns us that virtual reality is doomed to repeat the failures of the past unless we recognize what those failures are, and start thinking in a new direction. They remind us that a popular definition of insanity is “Doing the same thing over and over again and expecting different results.” In the context of virtual reality, they’re right. We need to do something different than what has already been tried and failed. What do people think is different this time around? “We have new technology!” “This time, we’re going to make virtual reality a platform!” “People are starting to take this seriously!” Those things are all important contributors, but are they at the heart of the problem? Only when we are able to recognize what we’re doing wrong are we able to figure out what needs to be different. In previous articles, we’ve identified two easily overlooked but very substantial user needs which were neglected in previous implementations. First, there was a failure to maintain novelty (as the initial novelty decayed, large virtual worlds became boring). Second, there was a lack of utility (there was little real-world value which people obtained in virtual reality). A successful Metaverse has to continue to entertain its users. If and when that fails, it has to provide real-world value if it hopes to retain them. Earlier, I wrote about the concept of the Virtual Home as the center of your activities in virtual reality. It is personal space, lounge, hangout, and launching pad. There are a number of ways to handle the user interface for the Virtual Home. We’re going to quickly look at VirtualReality.io, cover the concept for the Rift Navigator, and go back and pick up a great Virtual Home that I missed called Anarchy Arcade. After that, the conversation will switch gears to highlight a fundamental problem inside the Virtual Home (and virtual reality as a whole). VirtualReality.io is a no-nonsense launching pad for VR software. It doesn’t do a lot. It doesn’t have the personal space, lounge, or hangout. What it does do, though, it does correctly. They’ve got the launching pad covered for the novice user. I collect full-sized arcade games. Most of my games are from the 1980s, but occasionally I’ll find something newer that I like and I’ll add it to the collection. Arguably, arcade games are a decent enough example of how forces conspire in us to choose when a consumer technology succeeds and when it fails. Of the many possible reasons, we’re going two focus on two: novelty and utility. In the picture above, this arcade game had lost both its novelty and its utility. In the end, the only novelty it had left was to burn, and the only utility it had left to have its picture taken as part of a photo collection. The remaining pile of ashes had no significant novelty or utility to offer us. If you played arcade games in the 1980s, you’re going to relate very quickly to this example. Despite a previous article in which I explored how to represent a very large number of avatars in a single shared environment, I don’t believe that a single shared world isn’t going to be a mainstream approach. There are some good reasons why a large singular world should exist as one of several different solutions. But that’s a topic for another time. When your virtual world is faced with a large number of simultaneous users, you’re going to need to find a way to keep the load under control. This article is a (non-exhaustive) review of known techniques which may be used individually or in combination. We’ll be looking at denial, sharding, time dilation, feature reduction, and location distribution. I’m convinced that the Virtual Home is at the center of the user experience in the Metaverse. There is so much ground to cover, more than will fit in a single post. How do I convey a universe? My design sensibility tells me that we’re going to have to iterate this over time in order to figure out what exactly this space needs to be. My gut tells me that we’re going to need quite a bit of competition to make those iterations happen. “The Street.” That’s what Snow Crash calls it. The Street is a shared virtual environment that grew to be used by over a hundred million users. The author eases us into how avatars might interact in the Metaverse by describing a simple problem: how to reach the front door of a famous establishment. If these avatars were real people in a real street, Hiro wouldn’t be able to reach the entrance. It’s way too crowded. But the computer system that operates the Street has better things to do than to monitor every single one of the millions of people there, trying to prevent them from running into each other. It doesn’t bother trying to solve this incredibly difficult problem. On the Street, avatars just walk right through each other. You might remember that in a previous article, Griefing and the Metaverse, we touched on some of the issues involved when avatars collide. In an even earlier article, The sci-fi Metaverse is bad, we realized that the science fiction Metaverse is actually an unrealistic blueprint for what an actual Metaverse should be like. If you’ve been following some of the posts here on Metaversing, you may have noticed a slant towards planning and design issues. This isn’t by accident. Many issues seem innocent or almost trivial, but need to be carefully considered before jumping into an implementation. A well thought-out design can save countless hours of trouble down the road in the systems development life cycle.